Do the Trumps and Kushners Hate Each Other? 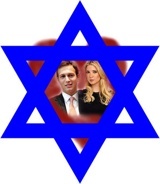 Ivanka Trump and real-estate golden boy and New York Observer owner Jared Kushner have been dating for over a year, and seem to be heading towards marriage—especially when you consider Ivanka's highly-publicized conversion to Judaism. But they keep denying that they're getting engaged, and we've heard a possible reason why: their families can't stand each other.We hear that Trump isn't happy about Jared's dad's time as a jailed felon over real-estate dealings gone bad, and the Kushners aren't happy about Ivanka's shiksa status, despite her ingratiating attempt to convert—maybe because the effort means she's serious about marrying him for real. It's so romantic—like the Montagues and the Capulets! They'll probably want to be together even more now.